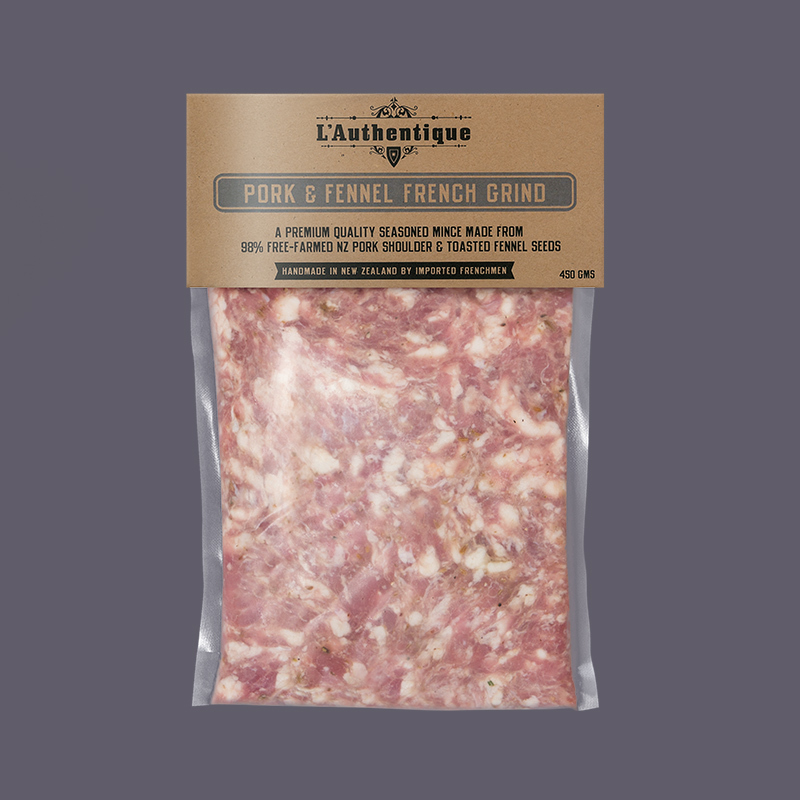 We make a special range of sausages using prime cuts of fresh free-farmed New Zealand meat, which is minced to retain a course grind tasting sausage, it does not contain; gluten, fillers or nitrates. 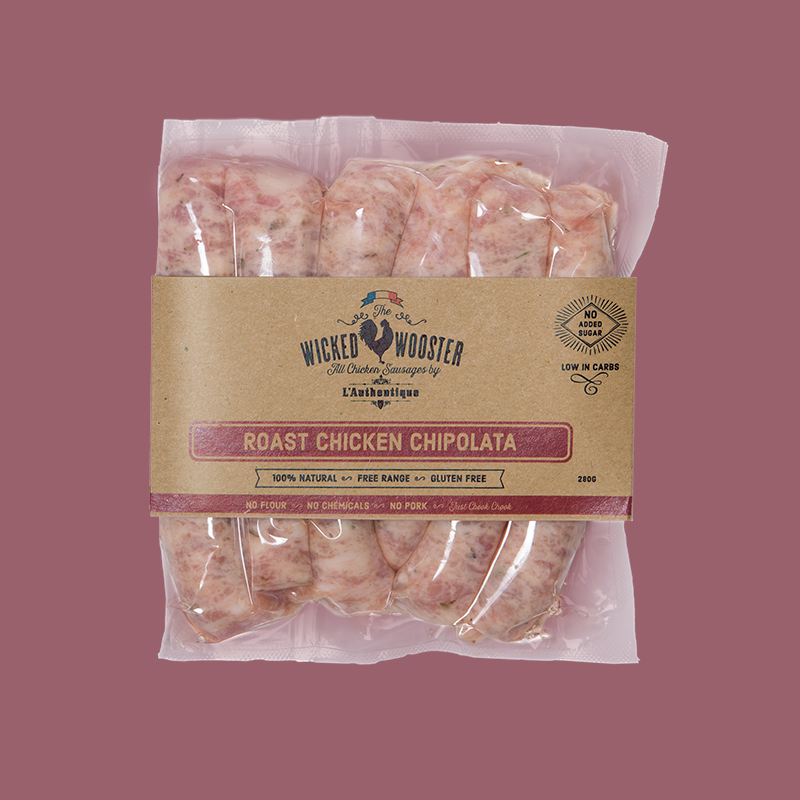 Each 280gm pack has four x 70 gram sausages. 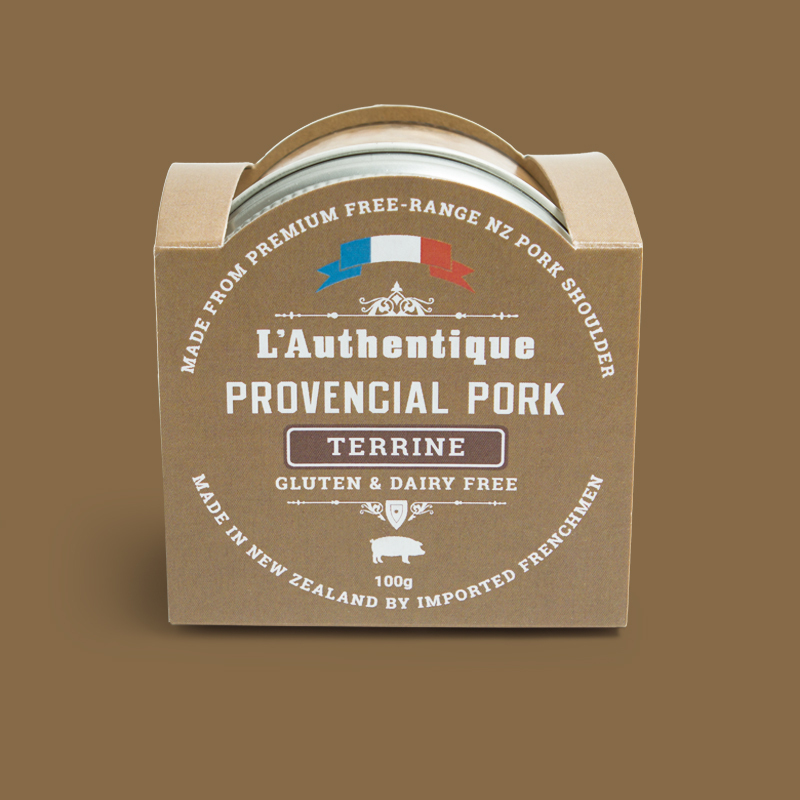 FREE-FARMED NZ PORK WITH FRESH GARLIC & PARSLEY, OUR TOP SELLER. GREAT AS A SAUSAGE, OR IN PASTA, SAUSAGE ROLL, LASAGNA, COTTAGE PIE OR EVEN DUMPLING FILLING. A SAUSAGE THAT TASTES LIKE A PERFECTLY COOKED STEAK - SEASONED WITH CONFIT GARLIC, MUSTARD SEEDS AND WINE. AN EXQUISITE LIGHT PATE TOPPED WITH A SHIRAZ JELLYACCENTED WITH GRAND MARNIER AND CINNAMON. FOR LOVERS OF THE DEEP SOUTH! ADDING OREGANO, SMOKE, CHILLI TO AN EXACT RECIPE DEVELOPED WITH EXEC CHEF XAVIER CARMONA, THIS IS MAGNIFICENT IN A GUMBO OR ON ITS OWN - HERBACEOUS AND FLAVORSOME. 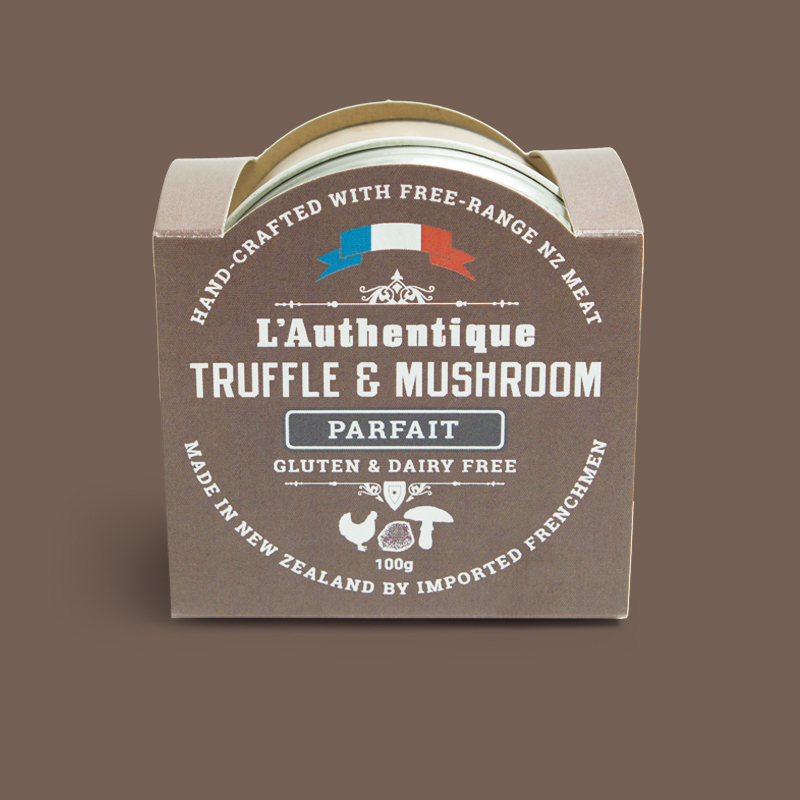 PORCINI AND FRESH PORTOBELLO ARE PERFECTLY ACCENTED WITH TRUFF OIL, GIVING EARTHY FLAVOUR REMINISCENT OF A TRADITIONAL FRENCH AUTUMN FOREST HARVEST. 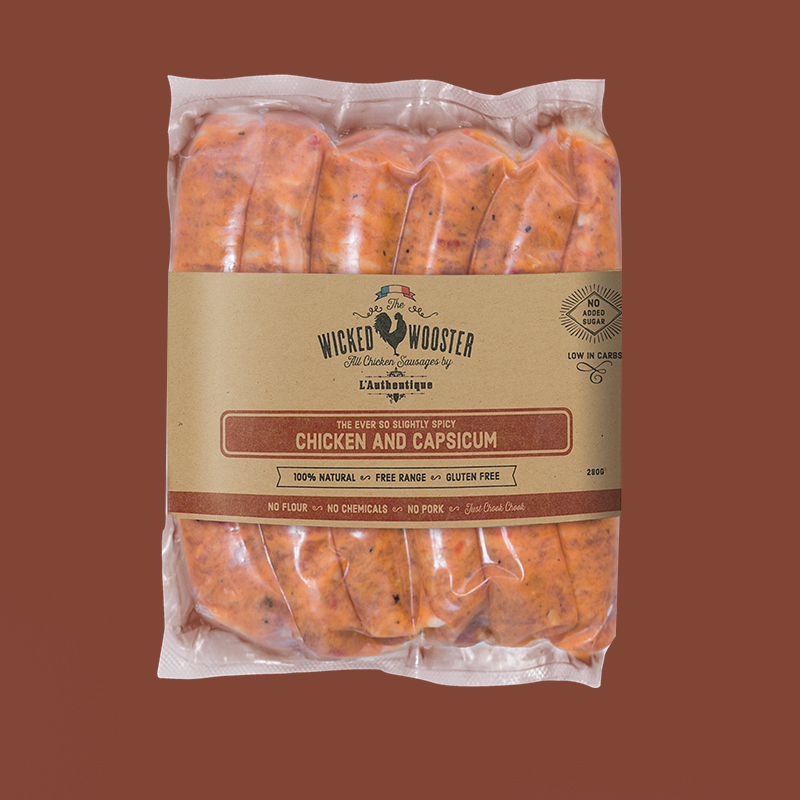 TRY OUR MOST POPULAR FLAVORS AND GET FAMILIAR WITH NZ'S BEST SAUSAGES. PORK & FENNE, TRADITIONAL TOULOUSE, BEEF STEAK AND PORK & FENNEL. 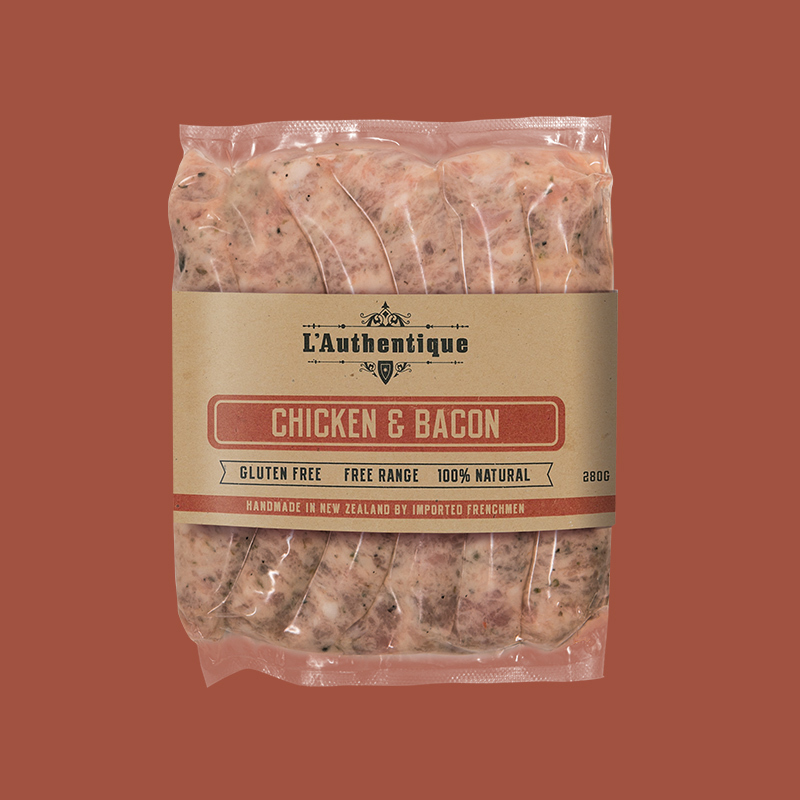 88% TENDER NZ FREE RANGE CHICKEN THIGH AND 6% NZ BACON MAKES A MOIST AND DELICIOUS SAUSAGE THAT WILL PLEASE THE WHOLE FAMILY. A PARTICULAR TREAT FOR BREAKFAST OR FOR THE LUNCH BOX. 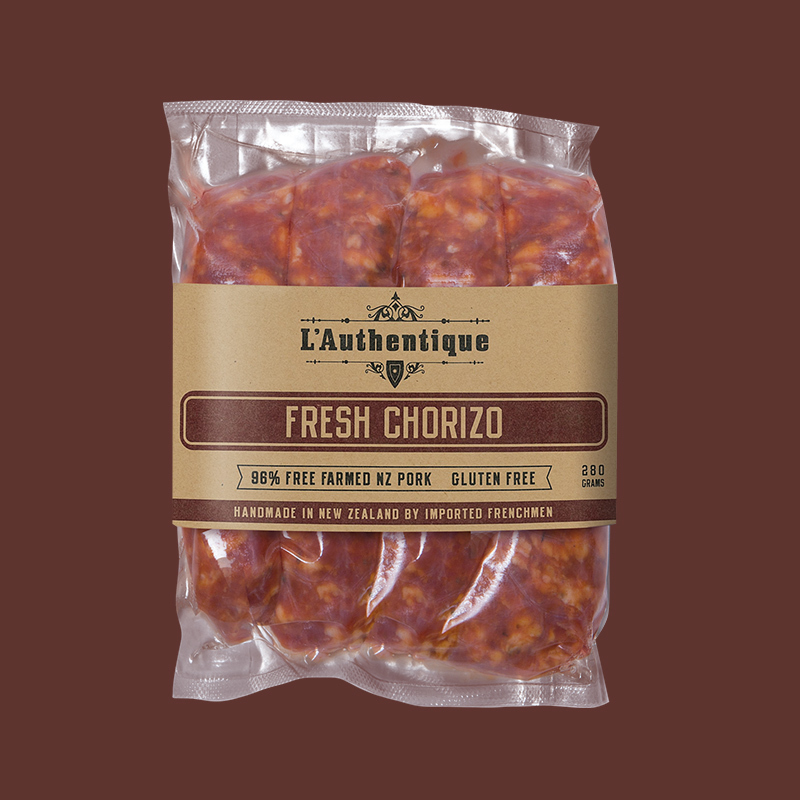 THE FRENCH COMMUNITY TOUT OURS AS THE BEST MERGUEZ IN NZ - THIS AUTHENTIC PORK-FREE MERGUEZ IS MADE OF LOCAL NZ BEEF AND LAMB AND IS VERY LEAN, SO MUST BE COOKED FAST, LIGHTLY, AND SERVED HOT. FRENCH BLOOD SAUSAGES ARE MADE WITH PORK BLOOD, MEAT AND ONIONS. IT HAS NO FILLER/BINDER SO NEEDS TO BE COOKED GENTLY TO RETAIN SHAPE. DELICATE & TASTY GLUTEN FREE BLACK PUDDING. GREAT BREAKFAST OR CANAPÉ ATOP CARAMELIZED ONIONS. THIS WILL PLEASE THE MOST PICKY SHOPPERS… USING FREE RANGE CHICKEN THIGH, LEMON JUICE, GARLIC, A LITTLE WHITE WINE AND OREGANO TO MAKE THIS PERFECT LITTLE SNARLER. (PLEASE NOTE IN ALL-NATURAL LAMB CASINGS). A VERY TRADITIONAL TAKE ON THE CLASSIC CUMBERLAND. ALL PORK, A LITTLE SAGE AND SALT AND PEPPER. LIKE A MILD CHICKEN CHORIZO. GREAT WAY TO INTRODUCE SPICE TO FAMILY - YOU CAN FLAVOUR A WHOLE PAELLA WITH A PACK OF THESE…(PLEASE NOTE WRAPPED IN ALL-NATURAL LAMB CASINGS). OUR STUNT SAUSAGE! WINNER OF THE HALLERTAU BEER & BANGERS COMPETITION - NZ PORK, FIVE SPICE, HONEY, SOY AND HALLERTAU, NOT AT ALL FRENCH BUT THIS ENTERTAINING SAUSAGE WILL SURPRISE AND DELIGHT. Our French Grind has been a staple for many of the most popular My Food Bag recipes, this versatile pre-seasoned gourmet mince adds flavour and depth to those mid-week meals that need to be produced in a hurry. The French Grind mince comes in a 450g Vacuum pouch, ready to be shaped into any meal or serving required. FREE-FARMED NZ PORK WITH FRESH GARLIC & PARSLEY, OUR TOP SELLER. GOES GREAT AS A SAUSAGE, OR IN PASTA, LASAGNA, COTTAGE PIE OR EVEN DUMPLING FILLING. 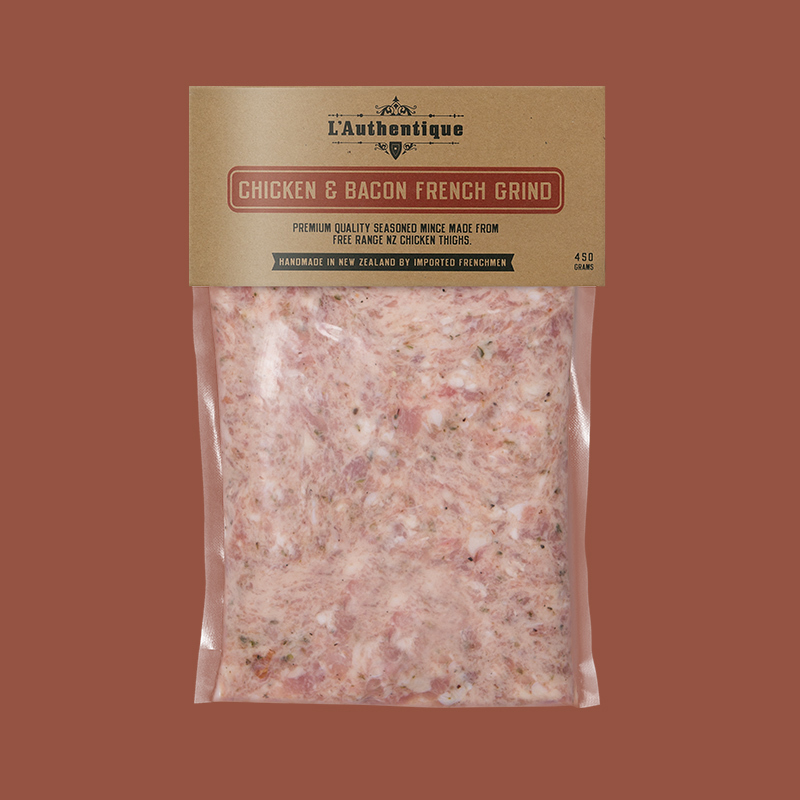 88% TENDER NZ FREE RANGE CHICKEN THIGH AND 6% NZ BACON MAKES A PERFECT GRIND FOR A KIDS BURGER, A BREAKFAST CROISSANT OR SAUSAGE ROLL. TOASTED FENNEL SEEDS MAKE THIS CLASSIC ITALIAN FLAVOUR SENSATION - ALL READY TO MAKE GOURMET SAUSAGE ROLLS, OR THE PERFECT MILANESE STYLE RISOTTO. HERE’S A FABULOUS AND EASY MIX FOR A FAST BOLOGNESE OR BURGER PATTY. Made with free range NZ liver, our parfait is finer than pâté. A pâté in France is a little bit closer to a terrine - denser. The parfait nearer a mousse - hence the word parfait. A parfait is a pâté that is more perfect! PORCINI AND FRESH PORTOBELLO ARE PERFECTLY ACCENTED WITH TRUFFLE OIL, GIVING EARTHY FLAVOUR REMINISCENT OF A TRADITIONAL FRENCH AUTUMN FOREST HARVEST. WITH ALL THE FLAVOURS OF FOIE GRAS, THIS ETHICAL PARFAIT IS HAND-MADE IN A CLASSICAL FRENCH STYLE, FROM HAPPY NEW ZEALAND FREE-RANGE DUCKS. LUXURIOUS, LIGHT AND CREAMY, THIS DECEPTIVELY SIMPLE PARFAIT OFFERS COMPLEX LAYERS OF FLAVOUR THAT CAN TURN A STARTER INTO A SITTING OF ITS OWN. AN EXQUISITE LIGHT PATE TOPPED WITH A SHIRAZ JELLY ACCENTED WITH GRAND MARNIER AND CINNAMON. In France, terrines are one of the basics of the charcuterie, they are used widely in gourmet sandwiches or as light supper dish. As a canapé, it’s served on baguette, with gherkins or some onion jam. It’s like a traditional more-delicate French meat loaf. The name comes from the dish it is cooked in. A SIMPLE RECIPE FROM FAMILY IN MARSEILLE, WE BLEND KALAMATA OLIVES WITH FOUR INGREDIENTS TO PRODUCE A BRIGHT BEAUTIFULLY BALANCED TASTE. Always made with liver - one of the best sources of vitamin A, and are generally served on toasted bread, a French crusty baguette or crackers, with a glass of wine. SMOOTH, SATISFYING FLAVOURFUL & DENSE, THIS NEW PATE OFFERS GUILTFREE ENTERTAINING - GLUTEN & DAIRY-FREE WITH NO ADDED ARTIFICAL STABILISERS. AN EXQUISITE PATE MADE FREE OF ARTIFICAL STABILISERS OR ADDITIVES. A REFINED SMOOTH TEXTURE WITH A CRACKED PEPPER FINISH. A rillettes is made from meat (not liver) that is more coarsely chopped or shredded, seasoned with salt and pepper and preserved slowly, to make a thick spread for sandwiches, or a stuffing for pasta. The savoury quality of our rillettes comes from using quality cuts and a generous quantity of salt.